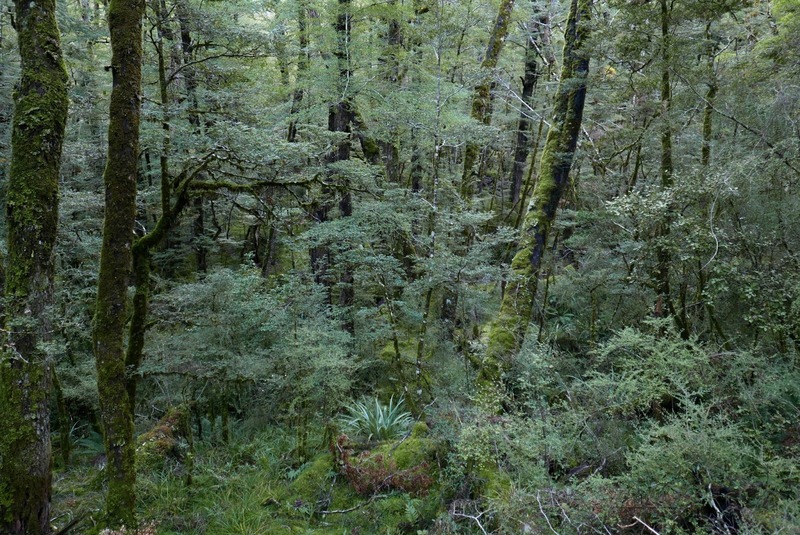 This is another essay about one of the many projects I worked on while I was at Camp Glenorchy, north of Queenstown on the South Island of New Zealand. The area is one of spectacular beauty, which was the primary inspiration for the things that I built there. A couple of years after completing the Labyrinth I was brought to New Zealand to work on Camp Glenorchy. I spent 6 months, starting in November of 2016, and then returned the following November for another 6 months. Early on I showed my client a photo of a driftwood mosaic built by an amazing stone artist named Lew French, from Martha's Vineyard in Massachusetts. I built a garden in Chilmark on the Vineyard for actors Brooke Adams and Tony Shalhoub and was able to see some of Lew French's fantastic work. My Mother gave me a copy of his beautiful book, Stone by Design for Christmas. 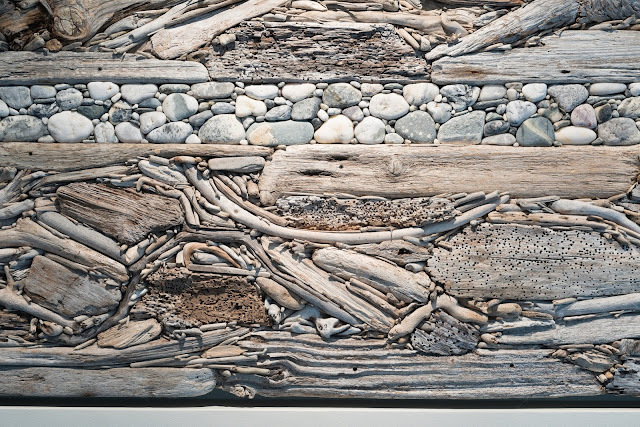 While he works primarily with stone, he sometimes incorporated driftwood in to his mosaics. Turns out I'd be following in his footsteps. 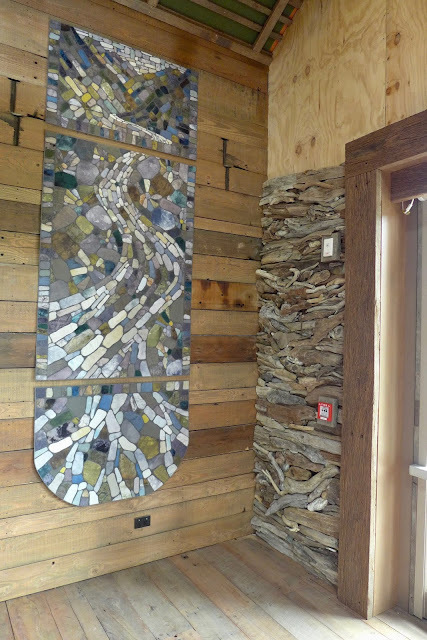 Fortunately I was able to work with a local master carpenter named Matt Hood, who had created wonderful wall compositions and trims in the room using recycled timber salvaged from demolished structures all over the South Island. Camp Glenorchy was built in compliance with the Living Building Challenge, which has the highest environmental standard for construction in the world, and dictates that recycled materials be used whenever possible. Salvaged wood and corrugated sheet metal from demolished wool sheds, stock yard buildings, and structures damaged by the Christchurch earthquake were purchased or donated, and brought to the camp. These timbers and planks exude character derived from the kind of wood they are, and the layers of old paint applied to them. They were sanded to reveal the underlying grain while retaining some of the color. 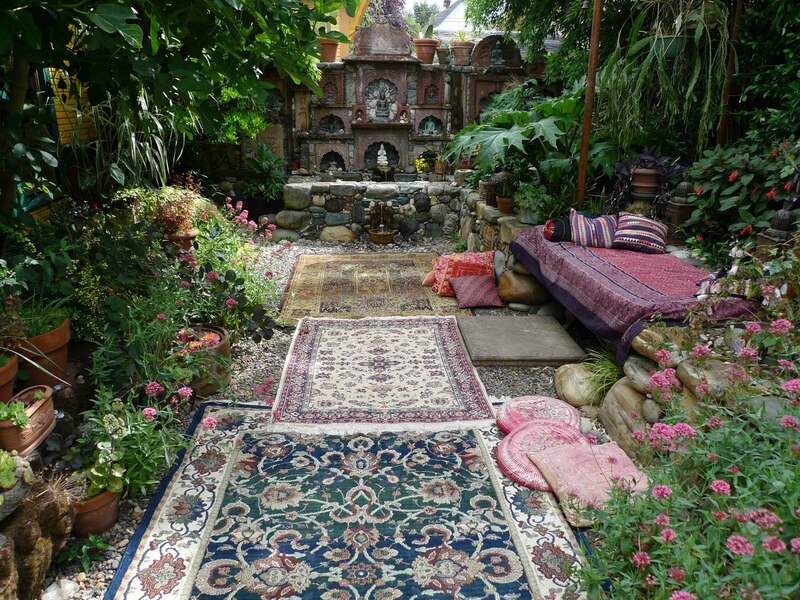 Then they were composed, and innovatively incorporated in to the design and embellishment of a variety of structures. 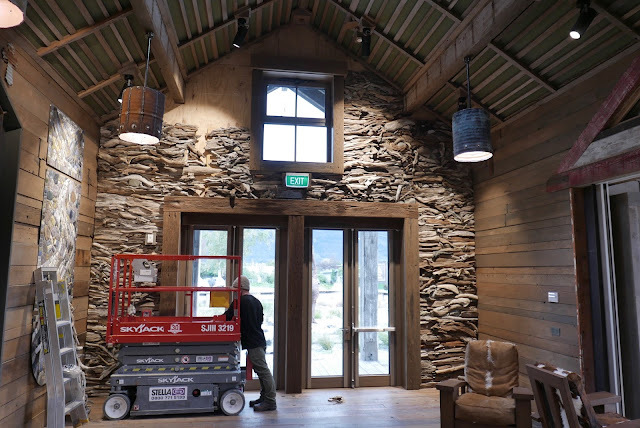 Rustic light fixtures were created with salvaged steel by Glenorchy artist Dan Kelly. A mixture of various painted and natural finish boards artfully collaged by Matt Hood in to the walls and trim of the Humboldt Room. Light fixtures, wryly nicknamed "Dan's Cans" hang from the ceiling. 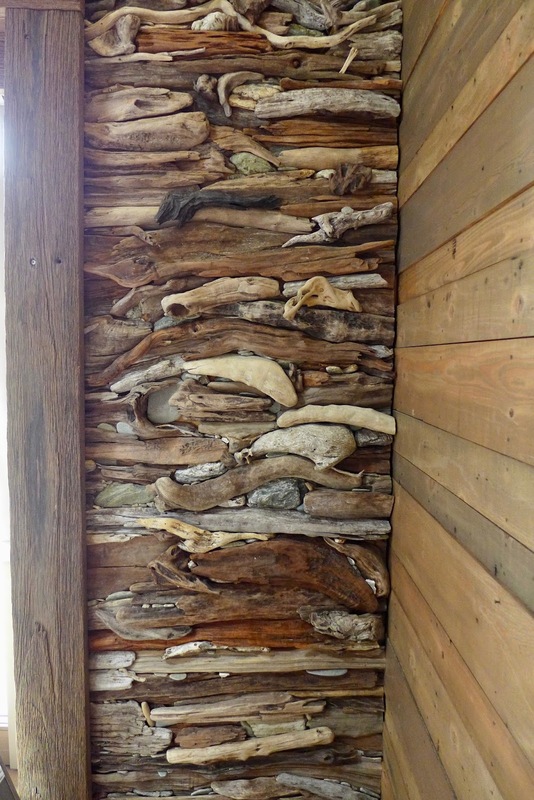 We had to divise a method of attaching the driftwood in a way that would be structurally durable but with no visible fasteners. Matt proposed that we screw the individual pieces from behind through sheets of strand board using screws of varying lengths, depending on the thickness of the driftwood. I suggested that a sample panel be built underneath a window in a niche between cabinets in the room as a way to try out the method we could use later. Matt took this project on while I was building the Geologic Wall in the next room, and fabricated a detailed miniature prototype. I had been collecting driftwood for some time, including along the West and South coasts of the island during exploratory adventures. 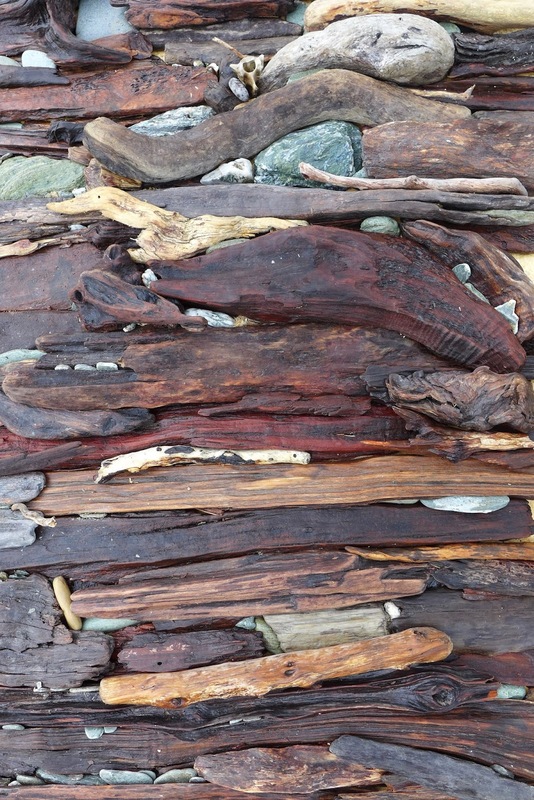 Whenever I found a cool looking piece of wood on the beach I would carry it back to my truck to add to the pile. The thing about large mosaics is that you need a lot of material to work with, more than you will actually use because its the ones that fit well that make the final cut. You have to have great patience and perseverance to manifest this kind of art. The camp officially opened in Mid March of 2018. The day before the opening, I was asked if I could mock up a section of wood mosaic so that people at the dedication ceremony could get an idea of what would eventually be covering the unfinished plywood. So I spent the afternoon tacking pieces together with finish nails in a temporary fashion. It was good practice fitting together the different shaped pieces and developing a sense of how the multitude of forms and colors of driftwood could be composed in to an artistic whole. When we finally started work on the wall, we needed a far greater selection of raw material, so Matt and I drove around the Lake to the resort village of Kinloch, where the Dart River flows in to the lake. 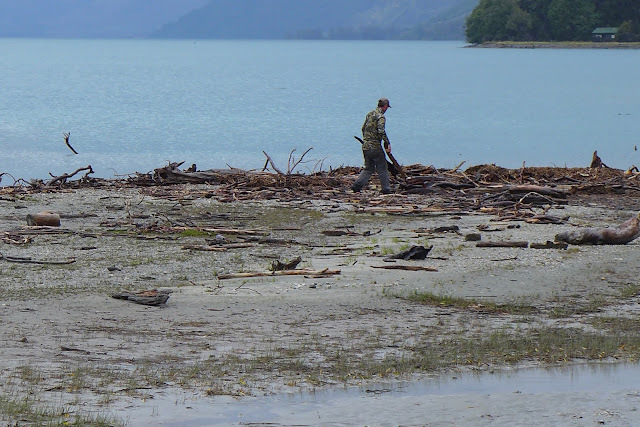 Vast amounts of driftwood are carried down the river and deposited along the shoreline here. The sheer volume of what we found in a couple of kilometers of lakeshore provided enough driftwood to mosaic the entire town of Glenorchy. One of the most interesting things about this material is that it represents all of the different types of wood found on the forests mountainsides that surround the rivers that flow in to the Dart and eventually in to the lake. There are hardwoods, wonderful red colored Totara, Red and Silver Beech, Southern Rata, Coprosma, and even exotic Goarse that was brought from Scotland to use in hedgerows. Each part of a tree is different. If a storm topples an entire tree in to a river, and it washes down to the lake, it will be broken on its journey in to smaller pieces that are eventually worn to a smooth finish. Roots structures are the most interesting as they snake through each other in fantastic shapes. Sometimes they hold stones like a gem set in organic jewelry. Burls can look like faces and ears. Trunks and branches with knots can look like birds, seals, witches and snakes. We often animated them, holding a piece over our faces and making funny sounds. The knarlier the piece of wood, the knarlier the character would be. These are literally the bones of trees, and they have many stories to tell. So the obsession began. We filled my truck. Then we filled Matt's trailer. Then he started showing up in the morning with more driftwood on a regular basis. We decided to work off site by the Caravan trailer that I lived in behind Mrs. Wooley's Store because I had a leaky shed we could work under if it rained. There was also space to unload and pile wood, and we didn't need safety fencing around us like we would onsite, and not be intrusive to guests staying there. The piles of wood grew to the point that it was hard to get to my door and I had to clear paths to keep from tripping and falling at night. A truck full of driftwood treasure. There is so much that you couldn't tell we had been there. Matt cut panels of strandboard in to the shapes of the sections of wall we were covering. This way we could screw the driftwood from behind, attaching it securely in place, with surprising strength. He ordered a selection of different lengths of self drilling wood screws so that we could access the thickness we were drilling in to and then use a screw that went in as far as possible without poking out the other side. I cut stones on my wet saw so that we could glue them flat side down to the strandboard, and then perfectly frame them with naturally fitted eyelids of driftwood. Originally we planned to make a Tree of Life, with a tree trunk trimmed flat on one side that would fit between the two sets of double doors and then branch out above them. But a green lighted Exit sign went up right where the crown would have started. While it would have been very cool, it was logistically much more involved to create a tree, so we went with a different concept. It was suggested by a woman with Maori ancestry working on the project that we allude to the Sleeping Giant in some way with the mosaic. I also had in my mind that a number of forest and water spirits intertwined in the work would as a whole would represent the spirit the giant. We would compose the driftwood in a section, finding pieces that nested together as if they were meant to be intertwined. I often say an affirmative "yesss!" when something slides perfectly in to place. Then we would screw that section together to secure it and continue onward. We used a lot of small pieces wood and pebbles to fill in the background gaps so that the strandboard wouldn't be visible. Once a panel was sufficiently covered, we lined it up with the one that would be connecting to it and attached more wood to it so that they would interlock seamlessly when we put them up on the wall. It was a learning process and things didn't always go as planned, but we were fastideous and made it work with the necessary adjustments. Once the panel was ready we would flip it over and Matt would trim the edges with a Skil and hand saw. The first ones we made went on either sides of the doors. Beautiful repurposed hardwood planks frame the doors and the panels had to fit behind those, and be flush with the walls at the corners. The trick there was that the walls are planked with varying thicknesses of boards that were uneven, so our panels got stuck on the thicker protruding ones. The first panels were large and we realized how heavy they were when it was time to move them, especially because of the weight of the stones and some of the dense hardwoods. We took the door trim off, made some adjustments to get the panel in to place, and then used heavy duty screws to bolt it to the wall. It was exciting to see the beginning to what would eventually become a dramatic work of art. Ironically, I think that the first panel we made is perhaps the most successful section of the wall for its composition and mixing of colors. Each following section has its own character depending on who was composing it. The other side of the door had the issue of a red fire alarm and a motion detector that we had to build around. The trappings of public buildings meeting code requirements is one of the joys of working on such projects. This side had to be done in 3 interlocking panels to fit around these units, which were neatly trimmed in hardwood frames. We actually did one of the panels backwards and had to do some adjustments to remedy this simple error. The measurements needed to be exact for the panels to slide in to place. If you take your time and really study the wall, you will discover a miriad of the details. Each piece of wood has a character unto its own, a root that circumnavigated a boulder, a branch that once reached for sunlight, knots that look like eyes, a fork stick that makes a mouth. Its not unusual for our minds to create associations related to that which we find familiar, and there are hundreds of creatures intermingling here. Once we had reached the top of the doors on either side we could start making panels that were more horizontal, spanning the wider space between the wall and the window. We could use longer and thicker pieces here that projected further from the wall. Some of the compositions are rather chaotic with so many wild shapes. I tried to include large driftwood to contrast all the little bits that were busily finding their way in to the mosaic. A panel made to fit over the doors. When we reached the gable, the panels had to be cut at an angle. 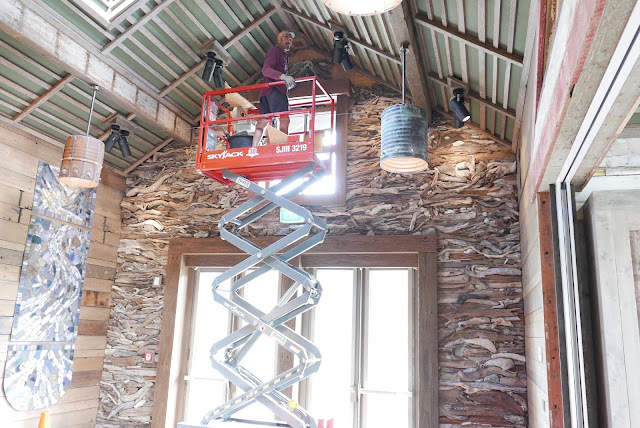 Because the ceiling has acoustical fabric overlaid with strips of hardwood, the angled edge had to be trimmed with individual pieces once the panels were in place. We also had to work around two beams that support the ceiling. We used a very fancy sissor lift to hoist the panels up and then positioned and bolted them to the wall. The Skyjack is an awesome machine that made the project logistically manageable. I was also able to attach wood to the wall in situ because this part is higher up and individual pieces of wood could be screwed in from the top where the fasteners couldn't be seen from the floor. I incorporated some paua (abalone) shells that were given to me for their reflective quality. Cut pieces of Paua are used for the eyes in traditional wood carving. More spotlights were added to illuminate the wall better. I finished the gable by creating an somewhat masonic looking mountain pyramid that speaks to the Humboldt Mountains that the room is named after. These dramatic mountains are visible through the glass doors and window. A paua shell eye gazes from the peak to suggest the collective wisdom of Nature watching over the lake and everything around it. People staying at the camp would come by to see the progress and return later with others to show them this crazy work of art coming to fruition. Its tangled composition captures the wild character of the places we collected the wood by the lake. 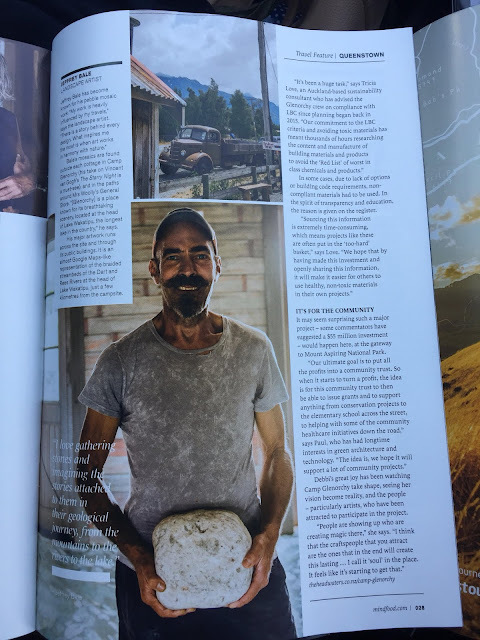 Once this project was finished I had fulfilled my goals for what was an intense and highly productive 6 months building homages to the magnificent beauty that surrounds the town of Glenorchy. Before I left we held a dance in the Humboldt Room to christen the wall. It was a magical celebration in a magical space. 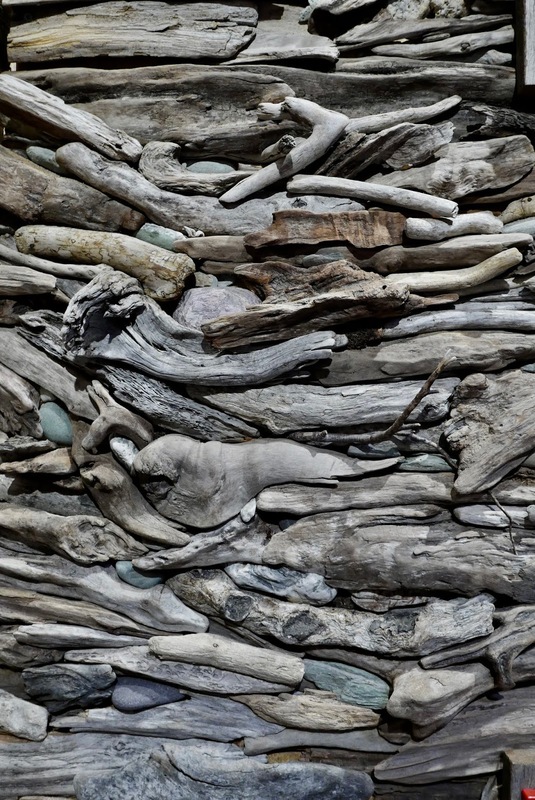 Dancing with Driftwood, a beautiful way to honor a labor of love. I'm inspired. 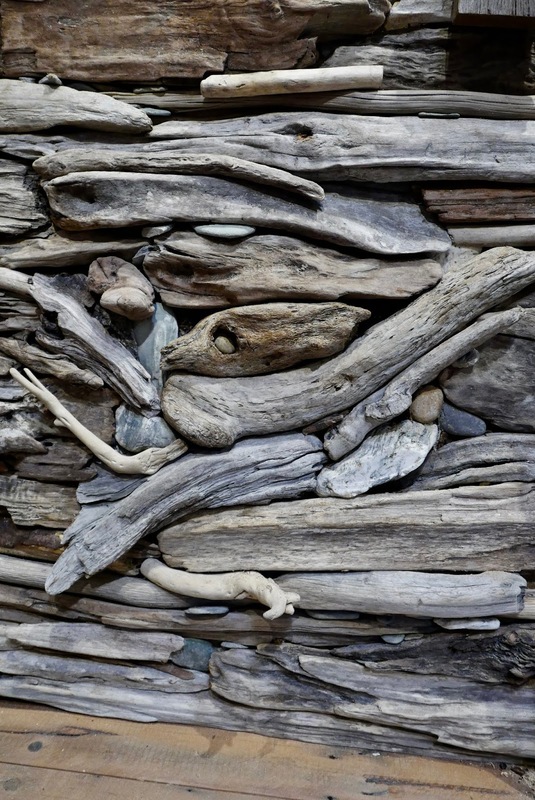 I love driftwood and rocks. You have given my artistic juices new thoughts to play with. Thank you for sharing your beautiful work. I just love how it turned out, and really appreciate you sharing the process! Jeffrey, would you be willing to share your small stone pathway mosaic technique? Some of your photographs show hints of the site preparation. Do you teach that technique in an academic setting or do you detail it in one of your books? I would like to attempt it myself. It looks simple enough to do badly. Kind of like playing the piano. Could it be similar in that anyone can play middle C if they know where to put their finger? Thank you in any case for sharing the photos of your amazing work.